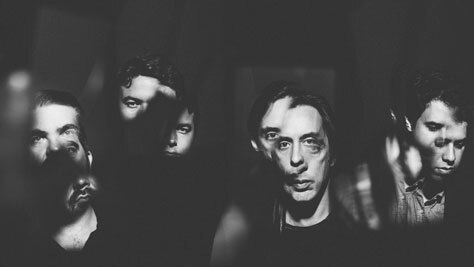 We’re delighted to be working with Wolf Parade for the first time – plus FRIGS! That unique combination of sounds and influences, spearheaded by electric co-frontmen Spencer Krug and Dan Boeckner – a complex yet relatable, energetic brew of glam, prog, synth-rock, and satisfying discomfort – helped define 2000s indie rock with three critically celebrated albums, and propelled a growing Wolf Parade fandom even after the band went on a then-indefinite hiatus in 2010. In the time apart, the band scattered geographically and focused on family and other work – Spencer on his solo project Moonface, Dan on his bands Handsome Furs, Operators and Divine Fits (with Spoon’s Britt Daniel), and Dante De Caro on records with Carey Mercer’s Frog Eyes and Blackout Beach. And that time allowed for an even stronger, tighter band to emerge. Eventually, Spencer, Dante and Arlen found themselves all back living on remote Vancouver Island, accompanied by a population density less than that of Alaska, and the tranquility that leads to creative emanations like a government-sponsored bathtub race. With Dan on the same coast in Northern California, discussions began about picking things up where they left off. The result of this new consciousness is songs like Valley Boy, a Bowie-inflected anthem for which Spencer wrote lyrics after Leonard Cohen died the day before the 2016 election (‘The radio’s been playing all your songs, talking about the way you slipped away up the stairs, did you know that it was all gonna go wrong?’). You’re Dreaming, also influenced by the election and the spinning shock that followed, is driving, urgent power pop that draws from artists like Tom Petty and what Dan calls one of his ‘default languages’ for writing music. The swirly, synth-heavy crescendo of Artificial Life takes on the struggle of artists and at-risk communities (‘If the flood should ever come, we’ll be last in the lifeboat’). Tour support comes from FRIGS. FRIGS are a Toronto-based band that pair the raw, emotional grunge of PJ Harvey with the immersive, psychedelic post-punk of early Sonic Youth. With each member bringing a unique set of influences, FRIGS create a sound that is hard to pin down and an impression that’s unshakable. Led by the force of Bria’s vocals, the band have earned a reputation for putting on an hypnotic and visceral live performance. Embracing the mercurial and experimental, their shows are built upon instinct; a vocal growl can unexpectedly give way to a hushed whisper; languid drones boil over into guttural and searing tones. Maintaining the communal, do-it-yourself spirit of their forbearers, the band bought recording equipment and turned their Toronto apartment into a studio where they wrote, engineered and mixed their 2016 Slush EP and two-sided single Chest / Trashyard.